Culture, Community, and Chicken Long Rice. The Annual Hawaiʻi Picnic celebrates Hawaiʻi culture by building community through song, dance and FOOD! Bring your own chair or hāliʻi (blanket) to sit on. Come make new friends, visit old ones, and share a delicious meal. All families and friends are welcome. Potluck - Please bring a your favorite local dish to share and your own non-alcoholic beverages as well as trash bags for clean-up. A potluck dish or beverage to share. Your instruments, mele, and hula hands. ﻿This event is completely free and open to the public. And please consider making a donation to Halawai here! This year's picnic will be dedicated to the memory of beloved kupuna, Uncle Newton Kulani Purdy who passed 5 year ago on February 11, 2012. Affectionately known as Uncle Ku, he was born in Hawai’i on October 15, 1928 and raised on Molokaʻi until the age of 9 when his mother passed away. His Grandma Lindsey and Aunty Elaine bought Ku back to Oʻahu where he was raised by Grandma until her passing in 1938. On Grandma’s passing, his Uncle Clarence & Aunty Florence Kinney welcomed Ku into their large ʻohana. Ku joined the army in 1947 and served in such faraway places as Alaska where he met his good friend Lani Pereira and in France where he discovered Hawaiian musician expats who had been living in Paris since the 1920s. After his discharge, Ku returned to New York to be close to his family & the Hawaiian expat community. He worked for many years as a leather cutter in the garment center and subsequently with the Hawai’i Visitor Bureau’s local office. Uncle Ku’s good-natured personality was infectious and people readily embraced him. So as the local expat population grew, Uncle Ku began collecting contact information as a way to keep everyone connected. His passion for "connecting and keeping in touch" led to his creation of the "Polynesian Registry" (way before Facebook and email). Over time, the Registry grew to include expats all along the East Coast. 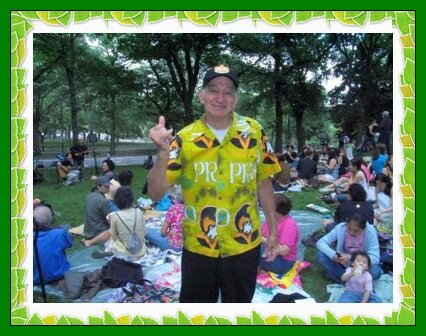 We also owe Uncle a debt of gratitude for planting the seed in the late 1950s that eventually grew into the annual Hawaiian Potluck Picnic in Central Park, a tradition which continues to this day, every June. At each and every picnic, you would find Uncle signing folks up for his registry. Whether you were Hawaiian or just someone with an interest in Hawai’i, Ku would count you as one of his NYC ʻohana. In 2002, the Hawai’i Cultural Foundation (HCF) honored Uncle Ku, along with Aunty Betty Makia, for his commitment to the NY/HI community and their lifelong contributions to promoting Hawai’i, its people and culture. The recognition brought Uncle to tears. Ku was an avid photographer and collector of memorabilia. His collection of news articles, programs, and menus was the main source for HCF’s 2003 event honoring the Hotel Lexington’s Hawaiian Room Hula Maidens. In 2006, Ku returned home to Molokaʻi but before he did, he gifted photo albums to the old-timers who had kept aloha alive in NY throughout the years. 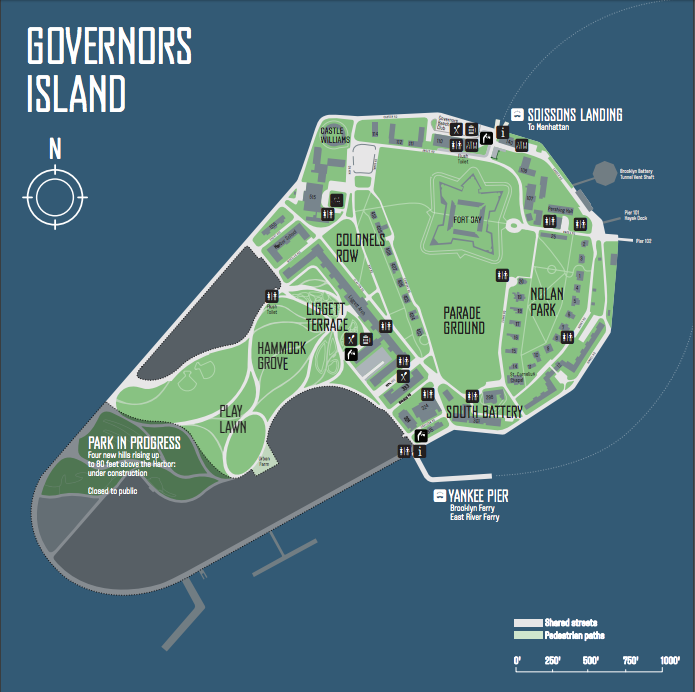 Getting to Governors Island may sound tricky, but don't worry, it's actually very accessible. There are three ferries you can take to the island, depending on where you're coming from. Ferries leave from the Battery Maritime Building at 10 South St., an old-fashioned, classic looking ferry building next to the newer, modern Staten Island Ferry terminal. To get there, take the 1 to South Ferry, the 4/5 to Bowling Green, or the R to Whitehall St. or the M9 or M15 bus. You can enter Battery Maritime Building in Google Maps and it comes right up. There are many portals at the Battery Maritime Building, and the entrance for passengers is the glass doors up a few steps. Be careful to read the headings on the ferry schedule. The Battery Maritime Building (BMB) is the Manhattan ferry terminal. Those departures are in the second column, not the first, so it's counter-intuitive. The ferry boat you want is called the Coursen. It usually takes longer than you think to find the right ferry dock in this area, so please plan extra travel time for yourselves. Ferries leave from Pier 6 at Brooklyn Bridge Park Greenway. To get there, take the 2/3 or 4/5/6 to Borough Hall, the R to Court St. or the B63 bus. Ferries leave from Brooklyn every half hour, starting at 11am until the last ferry at 5:30pm. Ferries return to Brooklyn at 11:15am, 12pm, then every half hour until the last ferry at 7:30pm. These ferries are free until noon and $2 for adults, $1 for senior citizens, and free for children under 13 afterwards. They are wheelchair accessible and can accommodate bikes as well. On these ferries and their schedules is here. The East River Ferry also stops by numerous locations around the city, including Midtown East, Long Island City, Williamsburg, DUMBO, and Wall St. For more information, go here. The ferry from Manhattan arrives at Soisson's Landing. The ferry from Brooklyn and the East River Ferry arrive at Yankee Pier. Our event is on the North side of Nolan Park. The walk from either ferry dock is around 5 minutes.